A large 9th-century stone Buddha greets you with an enigmatic smile as you enter Sri Lanka’s premier cultural institution, which gets better (in small increments) each year. 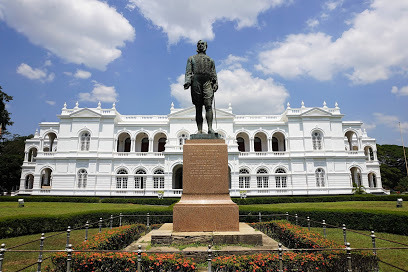 In galleries dating back as far as 1877, you’ll encounter all manner of art, carvings and statuary from Sri Lanka’s ancient past, as well as swords, guns and other paraphernalia from the colonial period. There are 19th-century reproductions of English paintings of Sri Lanka and a collection of antique demon masks. Rooms 2 through 5 have the powerhouse displays and are a must before visiting the Ancient Cities and Kandy. Look for the magnificent royal throne made for King Wimaladharmasuriya II in 1693 (room 5), as well as the 9th-century bronze Bodhisattva Sandals (room 2). Unfortunately, stairs are blocked off, forcing you to walk through the entire museum and you may find your enthusiasm wanes long before you reach the dusty agricultural displays. The grounds are shaded by magnificent banyan trees and there is a good cafe.